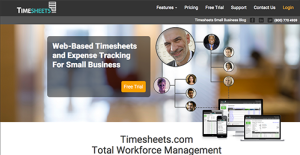 Timesheets is a web-based time and attendance tracking tool designed for small business. Timesheets.com keeps track of your employee project and attendance hours, expenses, as well as time-off. The online tool offers managers and business owners a very simple way to manage employee time even on the go, with location as well as identity restrictions. Its service includes customizable reports that enable businesses to analyze employee data and remain on track with reduced overtime and accurate payroll as well as billing. Timesheets.com has clients from the United States and in over 20 other countries. Customary timekeeping included paper leave requests and timesheets that must be marked, assembled, and included physically. While bigger enterprises can afford costly answers to supplant these obsolete procedures, small business come up short on resources to pay for expensive software. Luckily, cloud-based platforms have provided SMBs with affordable enterprise-grade solutions. Enter Timesheets which enable SMBs to track time-based compensations that can be used for payroll, billing, and projects that require accurate tracking of work hours. Employees can likewise utilize the software for keeping tab of reimbursements as well as HR files and information. The good thing with Timesheets is that you can disable some of its features if you don’t need to use them to streamline your workflows and processes. Timesheets regularly updates its software, introducing new features to an already extensive line-up of tools. The latest is a scheduling tool for employees that allow managers to make and keep work week schedules in advance and accessible right within the software. It's crucial to note that virtually no app in the Project Management Software category will be an ideal solution that can fulfill all the needs of various company types, sizes and industries. It may be a good idea to read a few Timesheets reviews first as certain services may dominate only in a really small set of applications or be prepared with a very specific industry in mind. Others may operate with an idea of being simple and intuitive and therefore lack advanced functions desired by more experienced users. You can also find services that cater to a broad group of customers and offer a complex feature toolbox, however that frequently comes at a more expensive cost of such a service. Be certain that you're aware of your needs so that you choose a software that has specifically the elements you look for. How Much Does Timesheets Cost? We realize that when you make a decision to buy Project Management Software it’s important not only to see how experts evaluate it in their reviews, but also to find out if the real people and companies that buy it are actually satisfied with the product. That’s why we’ve created our behavior-based Customer Satisfaction Algorithm™ that gathers customer reviews, comments and Timesheets reviews across a wide range of social media sites. The data is then presented in an easy to digest form showing how many people had positive and negative experience with Timesheets. With that information at hand you should be equipped to make an informed buying decision that you won’t regret. What are Timesheets pricing details? What integrations are available for Timesheets? If you need more information about Timesheets or you simply have a question let us know what you need and we’ll forward your request directly to the vendor.